This paper discusses five data collection methods that have been used as part of a pilot study investigating the relationship between school ground design, physical activity, and quality of play. Five simple procedures were tested at a Canadian school with green school grounds. 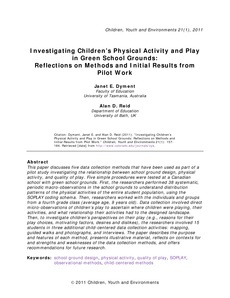 First, the researchers performed 38 systematic, periodic macro-observations in the school grounds to understand distribution patterns of the physical activities of the entire student population, using the SOPLAY coding schema. Then, researchers worked with the individuals and groups from a fourth grade class (average age, 9 years old). Data collection involved direct micro-observations of children’s play to ascertain where children were playing, their activities, and what relationship their activities had to the designed landscape. Then, to investigate children’s perspectives on their play (e.g., reasons for their play choices, motivating factors, desires and dislikes), the researchers involved 15 students in three additional child-centered data collection activities: mapping, guided walks and photographs, and interviews. The paper describes the purpose and features of each method, presents illustrative material, reflects on contexts for and strengths and weaknesses of the data collection methods, and offers recommendations for future research.